Aren't they beautiful!? For me, it's a toss up between RM by Roland Mouret and Roksanda Ilincic. 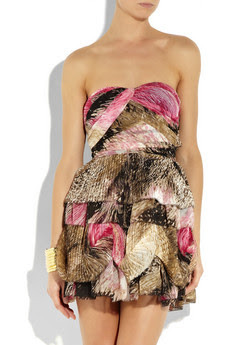 I'm usually not a big fan of the shiny, satiny type dresses, but those from Roksanda Ilincic are certainly an exception. How beautiful are the details.....that olive green number is some kinda wonderful! I'm also loving Bottega Veneta's leather dress.....what a classic. I love the fact that leather pieces, have taken a turn for the better. So often, leather pants and such were considered to be a bit cheesy or rockerish, but each season the designers make us take notice, but "classing" things up a bit. I'm looking forward to seeing all the lovely, detailed pieces for fall.